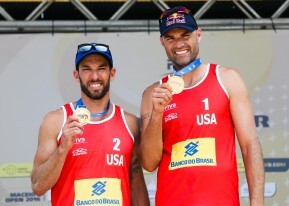 The Beasts of the Beach, Phil Dalhausser and Nick Lucena Storm Brazil and Win Against World #1 Team! Premier Management Group clients Phil Dalhausser and Nick Lucena dominate the first FIVB event in 2016 as they eye a return trip to Brazil for the Olympic Games this summer. Seeded 2nd at the FIVB season opener in Maceio, Brazil, U.S. beach volleyball stars Phil Dalhausser and Nick Lucena wasted no time proving they are the team to beat in 2016. The duo won the FIVB Maceio Open on Sunday with a spirited 2-1 (21-19, 19-21, 15-12) victory over top-seeded Brazilian’s Evandro Goncalves and Pedro Solberg. After a 5-0 start through round 2 of the Main Draw, Dalhausser and Lucena outlasted Brazil’s Alvaro Filho and Vitor Felipe in 3 sets to grind out a victory in a semi-final match that lasted 58 minutes. With the win, Dalhausser and Lucena are now poised to claim 1 of the 2 open spots to punch their ticket to Rio de Janeiro and represent the United States at the Summer Olympic Games in August. Dating back to last season, Dalhausser and Lucena have appeared in 7 of the last 8 FIVB World Tour Gold Medal matches, topping the podium in 3 of those events. They also took home international Gold Medal victories at the FIVB Xiamen Open and Puerto Vallarta Open last fall in addition to a victory at the AVP Manhattan Beach Open. To discuss potential sponsorship opportunities with Phil Dalhausser and/or Nick Lucena, please contact Evan Morgenstein at evan(at)pmgsports(dot)com or call (919)459-5426. For media inquiries please contact Matt Uberseder at matt(at)pmgsports(dot)com or call (919)459-5428.